When comparing prices on skid steer sweeper tractor loader attachment rentals in San Jose, Campbell and Santa Cruz, ask about sales tax and environmental fees. 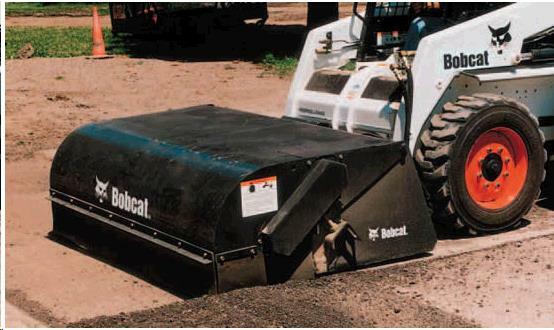 The Bobcat sweeper is perfect to clean parking lots, sidewalks, docks, warehouses, and more. You can also use the sweeper to spread material evenly across a site. Mounts to most mid sizes skid steer loaders with flush face fittings. * Please call us for any questions on our skid steer tractor sweeper attachment rentals in San Jose, Campbell, Salinas, Santa Cruz, Watsonville, Morgan Hill, Hollister, Santa Clara, Gilroy, Milpitas Sunnyvale, Fremont, Salinas, the Greater Bay Area and the Monterey Peninsula.